The Emergency Birthing for non-birthing and Level 1 Services Program is a one-day program based on-site within non-birthing services’ Emergency Department. The program has a strong focus on the management of unexpected labour and birth for clinicians who are non-practising midwives or non-midwifery trained. 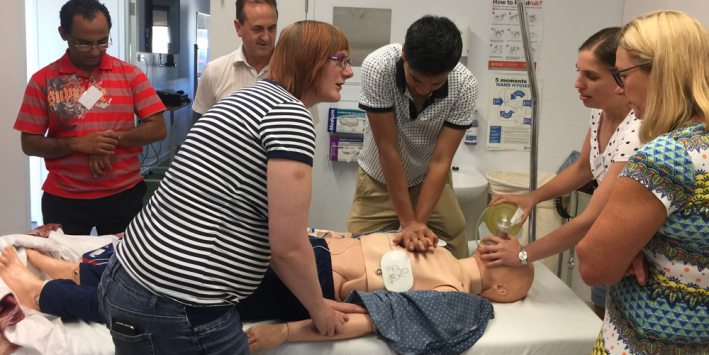 Content includes teamwork resource management and clinical risk management from a maternity and newborn emergency context using simulation, practical workstations and didactic presentations. Participants attending the program are encouraged to represent the multi-disciplinary team. Suggested participants include: midwives, registered/enrolled nurses, general practitioners (GPs), medical and midwifery students, paramedics and other clinicians as appropriate at your hospital. CPD Points and Procedural Grants are available for attending this program. Download the 2019 CPD Allocations document below. Identify women that may need referral for antenatal assessment or transfer of care to a higher level service. If you would like to schedule an Emergency Birthing program for your health service, please contact the MSEP team for more information.